Cast: Julia Roberts, Kirsten Dunst, Julia Stiles, Maggie Gyllenhaal. Directed by Mike Newell. Story: Julia Roberts is a 1950s art history teacher in a successful Massachusetts girls' school, struggling to express her modern independent views on a resisting academic community. 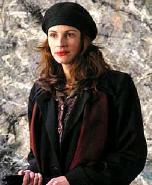 This film has taken a lot of stick and so it was with some resignation that I sat down to watch Mona Lisa Smile. True to form, the opening scenes had all the hallmarks of a light-hearted pointless chick-flick and I was starting to predict the remainder of the movie in my head. However, without shouting or pointing, the movie turned up surprise after surprise in its story, deliberately side-stepping the easy preach and instead letting the characters go their own way. This approach has been criticised by reviewers for lacking clarity and "a point", but that's what made it different and interesting to me. All the characters were observed for their personalities and how that affected their decisions, without placing judgement on any character or lifestyle - a sentiment cleverly reflected in the art history lessons of Julia Roberts' classes. While gently poking fun at the 1950s Massachusetts expectation that women exist solely to create homes and families, it was inoffensive and supportive in a way rarely seen in mainstream cinema, offering inspiration and opportunity to the entire cast, regardless of their outlook on life. I found that refreshing and very un-Hollywood and I think it deserves to be praised for that. Unfortunately though, its strengths to me will be its weaknesses to others, and many viewers will struggle to find the depth and provocation that I did (I've always been a bit funny). Julia Roberts never looks or sounds like she's in the 1950s and that lends a somewhat confused feel to the proceedings - and there is the occasional Grease-esque moment that could have used a little ironing - but look past its flaws and enjoy the story and there is much to appreciate. It does work as a chick-flick as well, if the satisfied murmurs from the 80%-female audience were anything to go on, but for me that is underselling it. It's a modest, unassuming, original and charming tale - and the girlfriend will like it too. Testosterone Satisfaction Rating: 0/5 Not a hint. To enjoy this film you should be: Prepared to think about the story. Or female. To buy Mona Lisa Smile from Amazon.co.uk, click on the picture below.